A reputed and feared gangster meets the love of his life and attempts to get out of a gang. But betrayal to the Dreaded Doctor will lead to fatal consequences. Can this henchman protect himself, his new love and find a way out alive? Do you like tales of mystery, intrigue and adventure? If so you will love Victorian Adventure Stories. Eleven tales all set in the reign of Queen Victoria during the 19th Century. Written in Jon-Jon's own 'Adventure Classic' style and salted with killer twists, you can expect Dinosaurs, Ghosts, Strange Creatures, Villains, Disasters, Gamblers, Romance and much more! 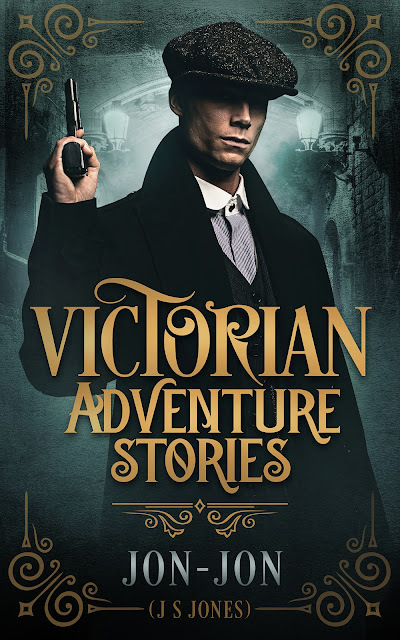 Victorian Adventure Stories will be released later in 2019. Scroll down for a brief synopsis on each story; some even have book trailers! An explorer obsessed with finding new discoveries scours the Hebrides, races home and claims to have to stumbled upon a uncharted island that holds terrifying secrets upon it. A man is warned by one of the locals of a fabled animal that roams the area. He must decide whether he should continue with his plans or should he really beware the Cats of Kensington Mews? A group of friends visit a quarry where they used to play as kids. All goes well until exploring a cave they make a bizarre and gruesome discovery. Two Gentleman race for the last train home after an evening in the public house, but the newly established London underground has secrets and their journey home soon turns into a mysterious adventure. A once wealthy man, bankrupt and on the verge of absolute poverty goes for one last night in an exclusive gentleman’s club where he is offered a reprieve in the form of a lucky poker chip – but is there any such thing as luck? Years after A Hebredian Adventure Professor James, Giles and Dean attend the Great Exhibition in the world renowned Crystal Palace, but a secret from the past would now come back to haunt not only them but the entire city of London! A relentless bully carries out his days torturing and bullying all in sight until a visit to the zoo teaches him a lesson that he will never forget. A box containing priceless treasure is stolen from a train station. The owner gives chase and is drawn into labyrinthal East London; can he retrieve his goods and get out unscathed? A man in fear of his life races to his friend in aid of shelter after being tortured by a fiendish apparition. His friend agrees to help but is there anything that can be done to quell this dark spirit? A couple deep in debt with a local crime syndicate take drastic action, but little do they realise what fate has in store.